Even more reasons to smile: Custom Wedding Cookies from SmileyCookie.com! Two great Pittsburgh traditions are coming together: the iconic Smiley Cookie, and the wedding reception cookie table. 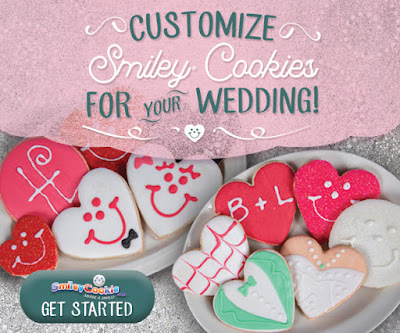 What better way to celebrate your marriage than by creating a smile with our new custom wedding cookies from SmileyCookie.com! Customize any of our new designs with your own wedding colors for the perfect addition to your cookie table, or let us wrap them individually for use as favors. We can even add you and your beloved's initials for a personalized treat. Custom wedding cookies are the perfect way to make your special day stand out! Our cookies are nut-free, kosher-certified, and can be shipped anywhere in the U.S.
Click here to start designing and order your custom wedding cookies now!